MI Rodríguez Fidalgo, Y Ruiz Paz, A Paíno Ambrosio, L Jiménez Iglesias (2017): “Use of Facebook as narrative tool to articulate the new political dialogue. The case study of Vistalegre II, the second citizen assembly of Podemos”. Revista Latina de Comunicación Social, 72, pp. 849 to 860. Introduction: Social media are being used as spaces for political debate with the purpose of enhancing interaction and participation between political actors and society. This article analyses the construction of such political narratives on Facebook from the perspective of the concept of “Engagement 2.0”. Methods: Quantitative and qualitative approaches are used to explore the new political storytelling on Facebook, focusing on the discourses published on Facebook by Pablo Iglesias and Íñigo Errejón during the second Podemos citizen assembly, also known as Vistalegre 2, and the reactions expressed by citizens through the comments they made on this social network. Results and conclusion: The results suggest the emergence of a political narrative where the citizen, in addition to changing its traditional role, powers new flows of information under the sender-receiver formula, becoming the true protagonist in these new digital political narratives. Political communication, social networks, Facebook, political narrative, engagement 2.0, politics 2.0. 1. Introduction and theoretical framework. 2. Methods. 2.1. Research hypotheses. 2.2. Research objectives. 2.3. Research techniques. 2.4. Sample selection. 3. Analysis and Results. 3.1. Main features of the narratives generated in Facebook about the political discourse under study. 4. Conclusions. 5. References. “Social networks and the philosophy 2.0 have been integrated in all kinds of organisations -profit and non-profit, public and private- so that the web 2.0 is also the business 2.0, politics 2.0, and government 2.0. And networks are meeting points, spaces for business and discussion. Social networks constitute a new environment and a new communication platform with citizens and organisations in a multidirectional communication model (all to all), but with the commitment to interact, i.e., to be a proactive user in virtual communities where people decides freely to stay” (2011: 86). Specifically, the use of internet-technology-related digital tools by political actors has enabled the emergence of the so-called political marketing 2.0 or politics 2.0, which started in the political campaign of the former President of the United States, Barack Obama, in 2008. As Castro (2012) points out, this campaign allows us to consider Obama as the most emblematic politician of the web 2.0. There are authors, like Castro Lampón, who consider that “modern branding and marketing techniques were without doubt the key to the electoral victory of Obama” (2009: 1). Today, the major developments that have occurred in this field have been related to the use of the aforementioned social networks (Facebook, Twitter, YouTube, LinkedIn...) both by political actors and citizens, in such a way that the communication flows and attitudes are changing within the political context (Túñez, Solana and Abejón, 2010). In this sense, and returning to Alvin Toffler’s concept of prosumer (1980), it is amplified within the context of the web 2.0, i.e., what were until now considered as passive audiences have now become more active than ever, since social networks, such as Facebook, allow the encoding and decoding of information of a given discourse (the politician-citizen pair), which has made some authors to call the web 2.0 as the “social factory” (Hardt and Negri, 2000; Ritzer, Dean and Jurgenson, 2012; Cheong and Lundry, 2012), where users cannot only consume information, but above all can produce different kinds of information, most of the times instantaneously and simultaneously within this online context (Catells, 2012). “[...] participation in environments 2.0 is more than mere presence, and in fact requires the active contribution of both creators and users and exchange of views and contents, so that both of them can obtain benefits, in full harmony with the concept of marketing. In this sense, politics 2.0 also requires the capacity of the politician to open up to citizens, encouraging their participation and valuing their comments and opinions” (2011: 87-88). Approaching the discourse of social networks, in the case of Facebook, allows us to explore new stories of political participation based on the direct access that citizens have to the messages that are offered by the different political parties, politicians and other traditional media already linked to the digital world, and this is precisely the object of study of this article. This section specifies the issues related to the methods chosen to carry out this study focused on the analysis of the discourses generated onFacebookin relation to the second Podemos citizen assembly, commonly known as Vistalegre 2, which took place on 11 and 12 February 2017, and was presided over by the leaders of the Spanish political party “Podemos”, Pablo Iglesias and Íñigo Errejón, as well as the reactions expressed by citizens through comments. The hypothesis of this study proposes the idea that the social network Facebook is being configured as a communication tool that is altering the political discourse. In other words, in the generation of the political message the role of the communicator of the message was traditionally performed by political actors, and the role of the receiver was performed by citizens. With the emergence of Facebook, these sender-receiver relationships acquire a new dimension, since now the citizen not only performs the role of the receiver, but can also be the communicator of the political message. In view of this new communicative situation, this study is based on the hypothesis that once citizens also adopt the role of communicator (prosumers), the same does not occur with political actors, who faced with the messages delivered by citizens do not generate the same reciprocity of reception and, thus, creation of a new message in response to what citizens are saying. Taking into account this new communicative situation generated in Facebook, which is transforming the figure of the sender-receiver of the political message, the second hypothesis of this study is that the concept of “Engagement 2.0” developed by Túñez and Sixto (2011), in this case, begins to materialise in the figure of the citizen. The objective of the study is to analyse the different political narratives adopted by politicians Pablo Iglesias and Íñigo Errejón and by citizens as a result of the second Podemos citizen assembly, known as Vistalegre 2, on the social networking site Facebook, in order to establish the extent to which the concept of “Engagement 2.0” materialises in the political discourse under study. To achieve the aforementioned objective, we have also established as a specific objective to specify the defining characteristics (level of engagement and role of political actors and citizens) of the different narratives generated in the social network Facebook, as a result of the interaction-participation between politicians and citizens in relation to the object of study, which will allow us to explain the concept of “Engagement 2.0” within this case study. To address the aforementioned object of study, we carried out a content analysis from a fundamentally quantitative perspective, based on the following coding sheet. Passive engagement level: when the citizen engages in consumption without undertaking content production within each discourse (fan or follower). 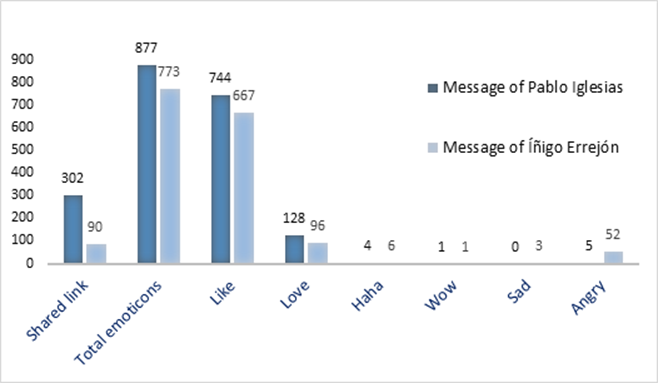 This variable was assessed with two quantitative variables: the first relates to Facebook’s “share” option, i.e., the number of times users share the information with others, and the “emoticons” linked to the feelings aroused by the discourse among citizens (number of times users selected the options Like, Love, Haha, Wow, Sad and Angry. Active engagement level: refers to a subject that reaches the condition of prosumer as a communication and protagonist actor within the discourse (Islas-Carmona, 2008). To measure the number of active subjects, we used the variable “#total of comments”, taking into account the “commentator” variable. 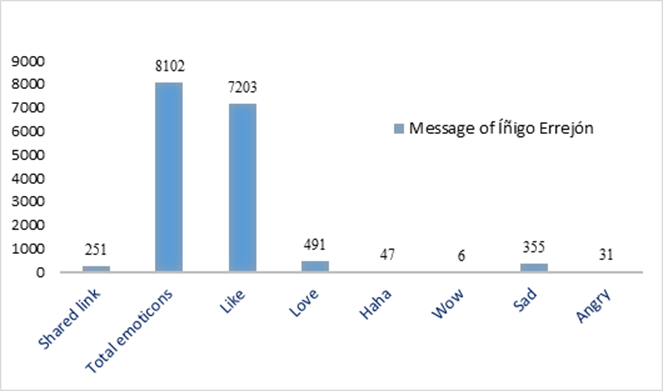 In addition, to understand the role of the political actor and citizen in the political discourse, we performed a second level of analysis focused on the comments made by active subjects in Facebook. This analysis first examined the narrative and subsequently classified it according to three main variables: “conformist”, “information provider” and “polarised”. These data have been complemented with a qualitative contribution that aims to analyse the internal discourse of citizens. “To tell you about my candidacy to the General Secretariat... I have to tell you about my team, for which you can vote at https://participa.podemos.info/es/ Team Pablo Iglesias”. “This is going to be our “Yes” Congress: unity, pride, illusion and victory Vote team Íñigo Errejón - Recover the illusion at https://participa.podemos.info #UltimoDiaVotaVA2”. With regards to the sample corresponding to the discourse generated by citizens around the aforementioned political messages, it amounts to a total of 1,140 comments. With regards to the data collection, data categorisation and coding was performed with the help of the qualitative data analysis software webQDA and Microsoft Excel. This section describes the data generated from the content analysis. In the first place, and with regards to the level of engagement of the political actors during the second Podemos citizen assembly, known as Vistalegre 2, it may be considered “passive”, since the interactions performed by Pablo Iglesias and Íñigo Errejón are limited to a single publication. 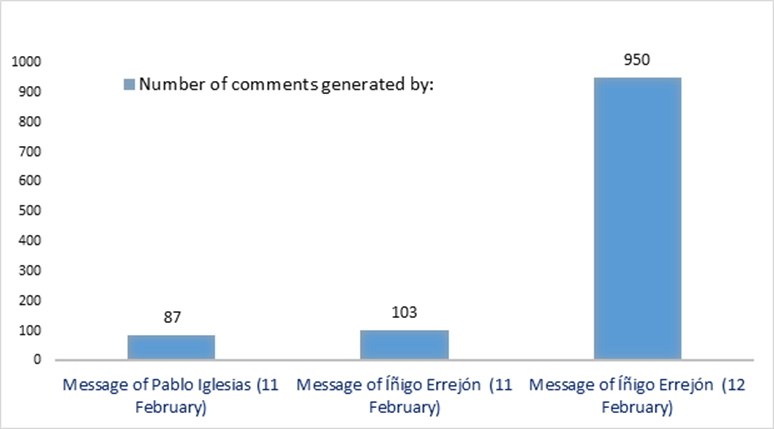 Citizens who adopt a ‘passive’ role, since they limit themselves to the role of “fan or follower” of the political messages delivered by Pablo Iglesias and Íñigo Errejón, and express their interest through the action of “sharing” and the expression of “emoticons”, but do not make any comments. Citizens who perform the “comment” action, which as mentioned allows us to identify the characteristic of ‘active’ level of engagement. Based on these data and continuing with the second level of analysis that seeks to determine the role of the political actors and citizens within the discourse generated on the social network Facebook, we have to point out that it was only possible to undertake this analysis on citizens since, as mentioned, the political actors under study limited themselves only and exclusively to publish messages and did not make any type of comment on the posts made by citizens. The in-depth analysis on the role of citizens based on the comments made on the political discourse allowed us to identify three fundamental roles: conformist, information provider and polarised. Thus, as shown in Figure 4, on 11 February, the most common role is the conformist, followed by the type citizen who provides information and, thirdly, by the polarised citizen. As shown above, the most common type of citizen is the conformist, followed by the information provider and finally the polarised citizen. A recurrent phenomenon in the new digital landscape is the ability of users to generate content within a virtual space, as in the case of Facebook. In view of this situation, the new narratives that are generated within the network are determined by the flows of information and the attitudes adopted by subjects within the network, i.e., the ability to produce new comments about what they read and watch. Finally, and from a qualitative perspective, with regards to the way citizens perceive the political discourse, it should be noted that the 1,140 comments made by citizens contain ideas around the following concepts: political leaders, “team”, “party”, “unity” and “all”. 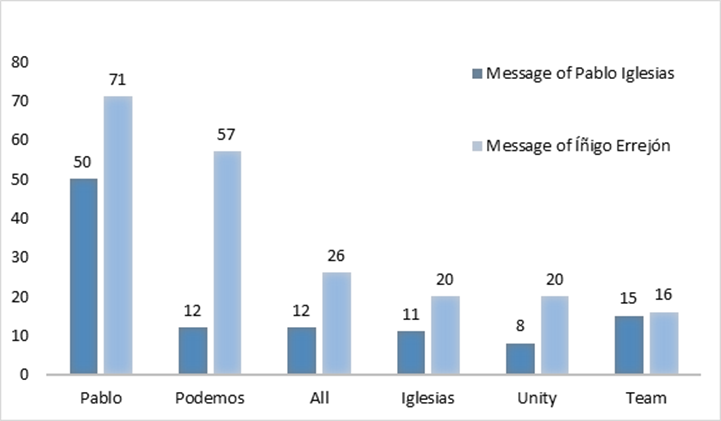 As Figure 6 shows, within the discourse of Pablo Iglesias the most frequently used terms were “Pablo”, “team”, “Podemos”, “all” and “Iglesias”. These terms coincide largely with the terms most frequently found in the discourse of Íñigo Errejón, which were: “Pablo”, “Podemos”, “all”, “Iglesias”, “unity” and “team”, in that order. The results obtained from the analysis have allowed us to confirm the initial hypothesis, which proposes the idea that the social networking site Facebook is causing new political narratives that are characterised by a new sender-receiver role of the digital political discourse which now becomes a message that receives feedback, which is an aspect that emerges from the definition of the concept of “engagement 2.0”. However, delving in this last concept and in order to establish the features that would define the political discourse under study, we have to point out that such feedback is not produced bidirectionally from politicians to citizens, respectively, since the political actors do not make comments, and limit themselves to publish messages. 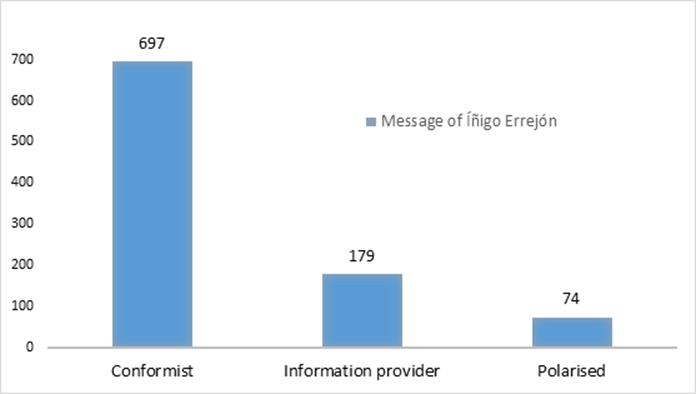 On the other hand, citizens begin to generate new flows of communication once the political message (publication) has been published under the striking receiver-sender structure respectively, whose main feature would be that this communicative flow occurs among citizens themselves, not in a process of feedback with the political messages. In short, while the political players adopt a role of passive communicators, and therefore a low level of engagement of interaction-participation, citizens modify their role by adopting a both passive and active role, which in turn would be characterised by three different roles: conformist, information provider and polarised. The latter type is the most innovative within the political discourse on the digital stage, as it generates new groups and consequently new re-codified messages, which enables the establishment of a high level of interaction-participation engagement. Finally, it is important to specify that the data provided derives from a specific case study and cannot be generalised or extrapolated to all political discourses generated in the social network Facebook. Precisely, this research work opens up a route of exploration and comparative analyses within this new political-communicative scene. Castells, M. (2012): Redes de esperanza y de indignación. Los movimientos sociales en la era de Internet. Madrid: Alianza. Cheong, P. & Lundry, C. (2012): “Prosumption, Transmediation, and Resistance: Terrorism and Man-hunting in Southeast Asia”. American Behavioral Scientist, 56(4), 488-510. doi:10.1177/0002764211429365. Hardt, M. & Negri, A. (2000): Empire. Cambridge, MA (USA): Harvard University Press. Islas-Carmona, J.O. (2008): “The Prosumer: The Communicative Agent of the Ubiquitous Society”. Palabra Clave, 11(1), 29–39. Sunstein, C. (2010): Rumorología. Cómo se difunden las falsedades, por qué nos las creemos y qué se puede hacer. Barcelona: Debate. Toffer, A. (1980): The Third Wave. Canadá: Bantan books. Túñez, M., Solana, M.Y. & Abejón, P. (2010): “Nuevos entornos, nuevas demandas, nuevos periodistas”. Estudios del Mensaje Periodístico, 16, 79-94. Related paper: Dasilva et al. (2013): Companies on Facebook and Twitter. Current situation and communication strategies. Revista Latina de Comunicación Social. Article received on 1 June 2017. Accepted on 19 July.